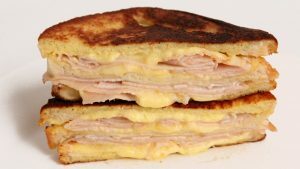 Burt Reynolds Monte Cristo Sandwich. On a flight home I was seated next to a gentleman who also was heading to Toronto. We spoke and he just was going to be checking possible locations to set up his food service company for the movie industry. He spoke about his California based company was expanding and he was going to put four of his mobile kitchens to work in Canada. As the conversation grew a position for me to break into motion picture catering was being formed. Months had gone buy and I had forgotten about this gentleman’s proposal when out of the blue he phones and offers me the executive chef position for his Canadian operation of Michelson’s Food Service and I accepted. 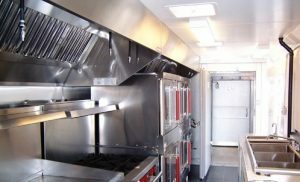 I was in charge of putting a staff together to work in four Modular Armenco 50 foot mobile catering trailers outfitted just like a restaurant with feeding capabilities and enough provisions, fuel and water to feed 125 people three meals a day isolated while on a movie shoot. The trailers have every convenience a restaurant has and were hauled around with a semi-tractor trailer unit. 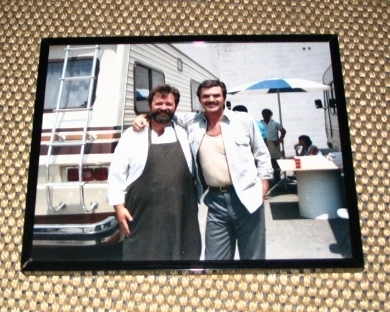 One of my first clients was TriStar Pictures and feeding the cast and crew of a 3 movie contract featuring Burt Reynolds. I received a synopsis for Mr. Reynolds and the other stars feeding requirements that would tide them over for the next eight weeks while they lived in trailers doing 18 hr. days of action in several different locations. I was first introduced to all the stars and the producer, directors and filming crew heads. Mr. Reynolds was easy to please. We talked and as the movie advanced so did our conversations spent together. Anything these industry people wanted at any time of the day or night was my responsibility. My schedule started at four am. Call was to a chosen filming set at a location that might take two hours to get too. All together there were 150 people to feed three hot meals a day with early breakfast and snacks in between. We sometimes would be shooting in 15 different locations and there was also requirements going to feed about 250 extras to feed as required. There would also be twenty five transportation drivers and 20 off duty policemen controlling road closures to feed. We also had to supply craft service which was a step van unit converted into a convenience store, pharmacy, coffee donut shack on wheels that was first to arrive on set without a hitch. 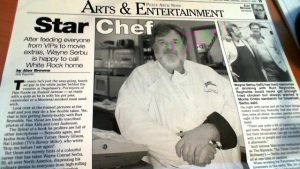 There were seven VIP Stars in this one film shoot that required my talents as a chef be stretched to the limit. Each star had a different feeding requirement. Vegetarians, no carb diet, protein supplements, gourmet fusion as well as Mexican, Jamaican, Asian East Indian, French, American Deli and Italian. I was told right at the start that you are only as good as your last meal served. If you displeased anyone with bad food you were out of there faster than free donuts left buy the coffee thermos. Well I managed to keep everyone happy for the many weeks on the first picture shoot and was offered more contracts now including a Paramount Pictures movie shoot that stared two of my favourite actors Alan Alda and Ann Margret. More on that later. For the first couple days on shoot Mr. Reynolds personal assistant would come for his meals. The next morning I was invited to his trailer to be formerly introduced and in the same trailer sat his wife at that time Loni Anderson, co-stars Ned Beatty, and Dom DeLuise who were also his close friends. They all welcomed me warmly and said my first couple of days that I served up some pretty impressive grub. As an good old southern boy Burt spoke about how he hankered for his favourite snack a Monte Cristo sandwich. I took his cue and went to work on his request. The original sandwich was a once very popular in the fifties, but it was one of those recipes that have about a dozen copies and it has sort of fallen through the cracks here and is mostly only seen in the southern states now. 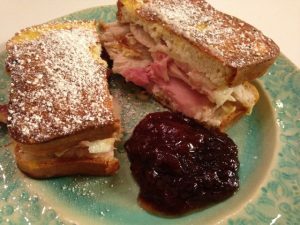 Here is the recipe for a first class Monte Cristo Sandwich as requested by Burt Reynolds. 3 slices of firm textured white bread. 2 slices of roast turkey. 2 slices off the bone ham. 4 slices of Swiss Gruyere Cheese. In a shallow mixing bowl whisk together the egg, milk and ¼ teaspoon salt. Set to the side. Now spread each bread slice generously with butter on one side and lightly sprinkle on some salt. Top one butter up slice with half the turkey and ham slice plus half of the cheese. Top with the other slice of bread and lay the remaining turkey, ham and cheese. Cover with the last piece of bread buttered side down. Now give the egg mixture another quick whisking and dip the sandwich in the mixture. Let it rest for a moment to absorb the liquid, turn and repeat for the other side. Heat the oil and butter in a skillet pan or medium heat and wait till the butter is melted. Add the stacked sandwich and pan fry for about 5 minutes gently turning and lightly pressing down with your spatula after each turn 3 to 4 times until golden toast marks appear on both sides. Cut and serve with some maple syrup, cranberry strawberry or red current jam on the side!